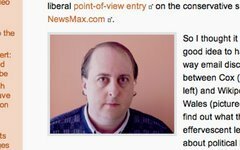 Following up yesterday’s post detailing Bob Cox’s decision to reveal personal information about one of his critics… it actually gets worse. What could be worse than publishing the height, weight, phone number, education, etc. of an individual posting comments under a pseudonym? y purpose in posting as much information as I could find about [name of Cox’s critic] was simply to make the point that she is not as ‘anonymous’ as she thinks and that her behavior may also come with a cost. Just as she made her hate speech about me a part of the ‘permanent’ record of the internet via Google, so to is information about the actual person who wrote all that stuff. My hope is that someday, somehow she will be held accountable for her behavior. In the meantime, that she does not like is reason enough. It's called getting a taste of your own medicine, something [name of Cox’s critic] father knows something about.